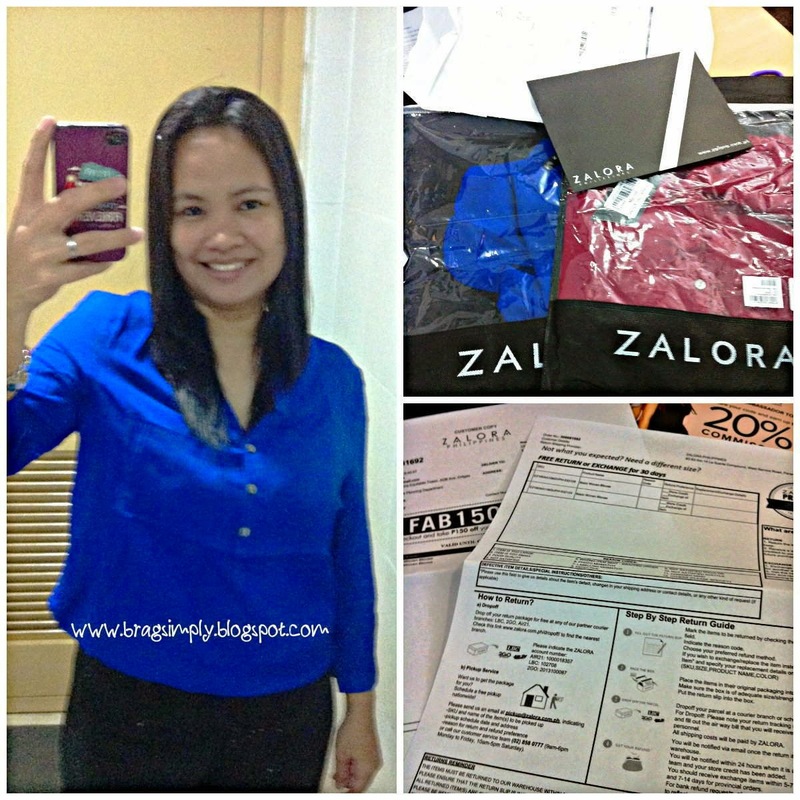 My First Zalora Philippines Shopping Experience | To Be, To Be. Tutubi. Full disclosure: I received a P1,000 Zalora online voucher for a writing gig that I did last month (and I used it for this purchase but this blog post is purely my experience that I am sharing with you). 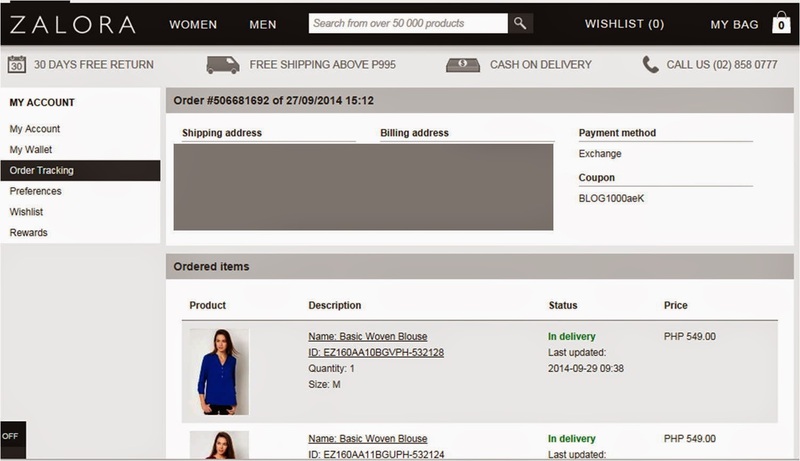 It was valid for one year and I can use it to purchase any item online ( except for no-sale brands and non-sale category). I already signed up at Zalora some time back but haven't had a chance to check out the site so when I received the voucher, I started checking out the items. And oh boy, was I glad that I did! I first checked out the Jansport bags, then the clothes, then the shoes. I actually had a grand time putting items on My Bag when I liked something, and then I would go back and remove it when I changed my mind. I did this for 2 weeks, hahaha. I was actually about to check out with some flat shoes, umbrella and wallet, but decided against them at the last time. I had fun "window" shopping, hahahaha! 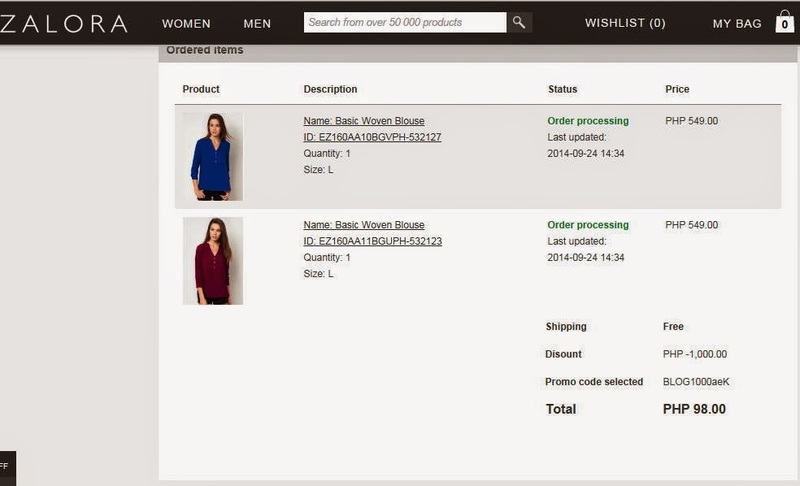 It was quiet easy to remove and add items and when I logged on again last week, I checked out their women's clothes section and fell in love with these basic women blouses and bought 2. Then I finalized my order. Its so easy I do not have to show you how to do it. Even easier than buying from Metrodeal, hehehe. So before finalizing my order, I entered my online voucher in the box where its says " gift certificate or promo code" and Voila! I just had to pay P98. There were may payment options but I opted to pay cash upon delivery. Then, on September 24, my order was placed and on-process. A minute after, I received an email that my order has been confirmed and delivery (which was Free by they way for purchases above P1,000) will be in 1-3 days. That was a Wednesday. And surprise, surprise! By the following morning, I received an email that my order has been shipped, and at around 9-ish, they have arrived in my office! I paid the courier the P98 that I still owe them, sign some papers and went to my cube to check my orders! I was so excited! I took photos and then ripped the packaging to get my stuff. Unfortunately, they were too big! I ordered L because I am a large. But my friend said that I should have checked if the sizes are in US because I would be a size smaller then. Good thing, they offer free return or exchange. So I immediately called their customer service and asked for a free pick-up of the items. I was instructed to fill up the form inside the package and indicate the replacement or exchange details so I changed my items to a M. Then the girl said that they will schedule the pick-up of the item. I again received a email that my request for pick-up has been acknowledged. And the items were picked up by Friday afternoon.And then lo, and behold, the new items were delivered at around 2pm today, Monday. The woven blouses were in M sized as requested, and they came in this nice resealable bag. 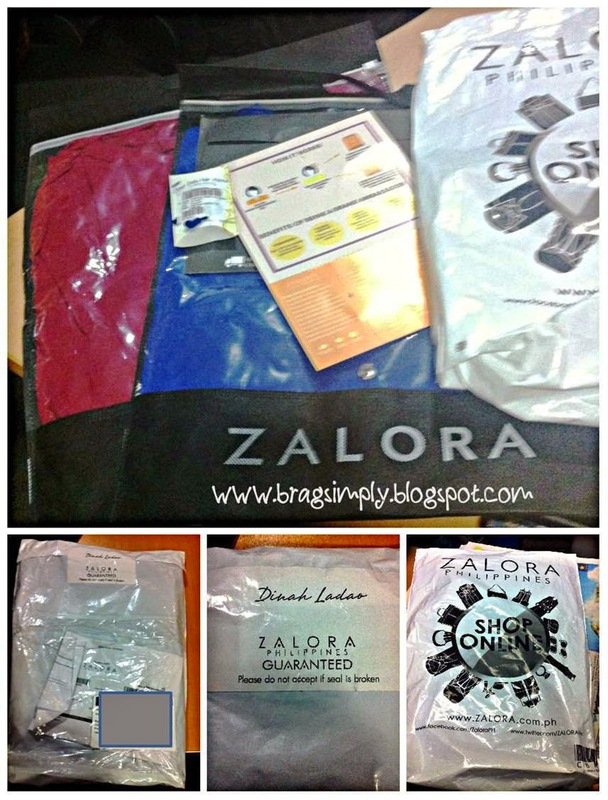 So, yes I was very happy with my first Zalora shopping experience and I am sure to go shopping some more. Their prices are actually competitive. Their Fila rubber shoes on sale are the same with we have here at Robinsons Galleria. The Jansport bag on sale is even cheaper at P1,700. 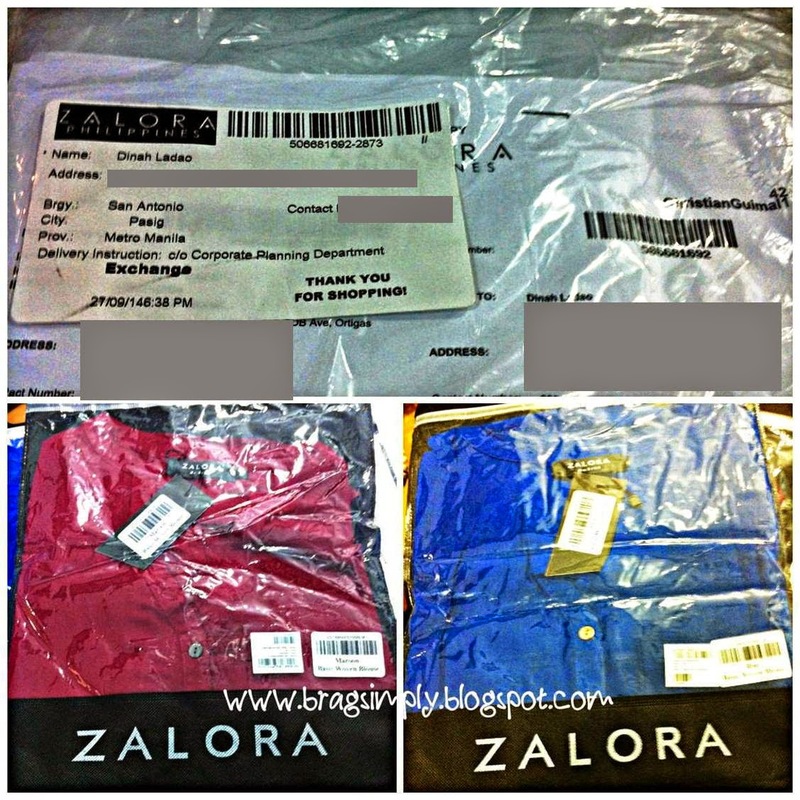 And my orders even came with another Fab P150 promo code that I can use in my next purchase!